NEW show – Receives 4.5 Stars at Perth Fringe! Sassy sadistic Bunny is one deranged dame! 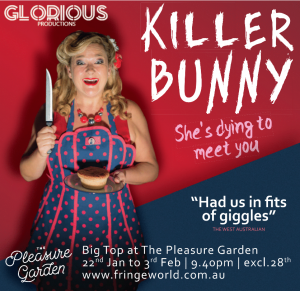 Seen in 3 award nominated Fringe shows she’s back from the UK with her special brand of murderous comedy. 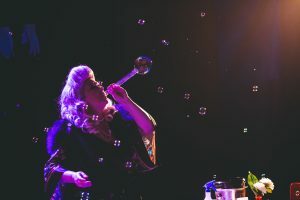 A domestic goddess on the hunt for man, Bunny is a bubble blowing, knife throwing crazy lady, ready for a tense and terrifying finale. Do not miss this long-awaited return to FRINGE WORLD! Hailing from the UK, Bunny has been charming men and thrilling audiences the world over for five years. Back from a fresh new hunt, she is ready to thrill you with her adventures. Fresh new tricks, comedy and skills, come and be thrilled by the UK’s most charming knife thrower! Expect knives, bubbles, booze, cabaret and a little discomfort!